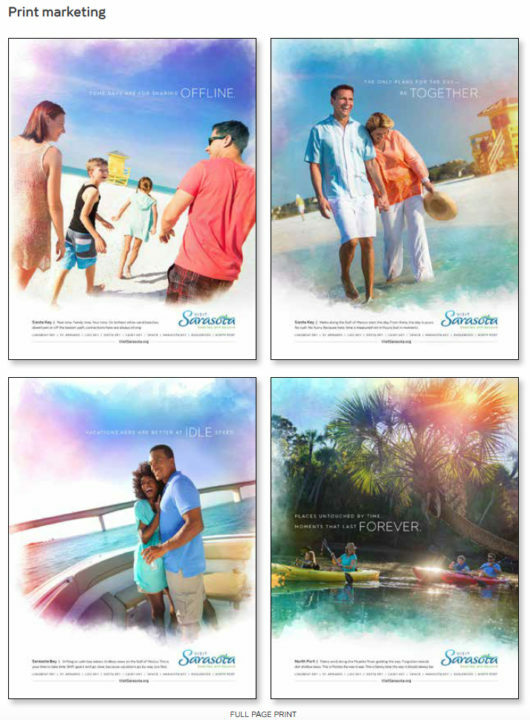 The number of visitors to Sarasota County in December 2016 increased by only 0.5% compared to the same month in 2015, but domestic tourists “were a real bright spot,” the president of Sarasota County’s tourism agency has reported to City and County of Sarasota elected and appointed leaders. “However,” she continued, “with the strong US dollar we have seen significant drops in Canadian and European business …” The number of tourists from the United Kingdom has been “down just slightly,” she added. As for other December 2016 statistics: Hotel occupancy declined by 1.3% — to 68.2% — and the hotel average daily room rate grew 0.9% to $174.55, Haley wrote. During the Nov. 17, 2016 Tourist Development Council meeting, Haley provided the members a rundown of the seven new projects underway or planned at that time, with the 139-room Aloft Hotel already having opened in February 2016 on Palm Avenue in downtown Sarasota. When asked to look ahead for the next three months, Haley wrote in her Jan. 26 email, general managers of the county’s hotels reported demand remaining the same as it was last year or dropping. Although the December figures for the county’s Tourist Development Tax (TDT) collections will not be available until later this month, the Tax Collector’s Office has reported that through the first two months of the 2017 fiscal year, revenue has continued to climb. The TDT total for October 2016 was $997,831.92, up $20,509.19 from the October 2015 figure. For November, the TDT collections added up to $1,017,538.63, an increase of $16,609.16 compared to the November 2015 figure. Sarasota County set another record in the 2016 fiscal year for its TDT revenue, breaking the $20-million mark. In months past, Haley has cautioned county leaders that they should not bank on seeing the trend continue. 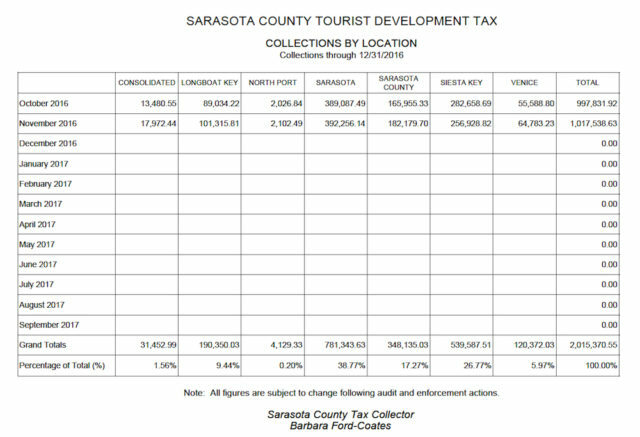 As for the TDT collections by location through November 2016: The city of Sarasota led the way, with 38.77%. Siesta Key was in second place, with 26.77% of the total. By the end of recent fiscal years, Siesta Key has ended up surpassing the city. During the Jan. 19 meeting of the county’s Tourist Development Council (TDC), Duggan reminded the advisory board members that 20% of the jobs in the county are related to tourism. That is all the more reason, she pointed out, that the Visit Sarasota County staff works constantly on new marketing ideas and campaigns to keep visitors coming. The decision on the brand followed extensive research, Duggan explained, including work with consumer focus groups and internet surveys. “The core thing that we saw consumers say about Sarasota County that they weren’t saying about our competitive set was that they really, truly felt at ease” in the county, she added. The new logo consistently was ranked first or second among those from other areas with which Sarasota County competes for tourists, she added, including the brand for the Florida Keys and Key West.